Gone are the days to print Tees and pray for sales. This is the new world of design and sell. Do your niche of designing to the trend and market it smartly. Qikink takes care of printing them after the order is received for a design(Yes! single piece orders) and pack them with your brand name to dispatch it to your customer. What is Qikink all about? You can make your designs available with us in advance for speedy processing. You shall provide high resolution(minimum 300 dpi) png image and a T-Shirt mockup for each design. Your designs are sensitive data to us and it will never leave our premises, all the processes are done in-house. 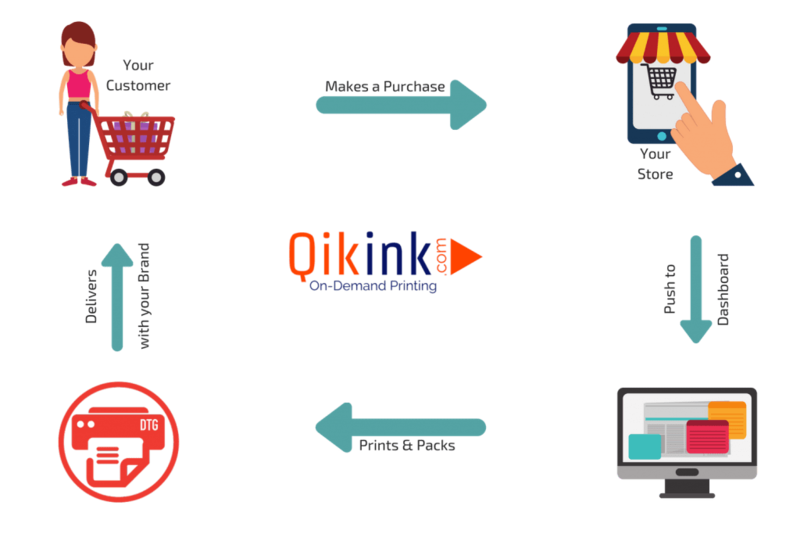 We help you to understand the QikInk’s process clearly, you can clarify them before processing orders. You shall know about our product styles, garment sizes, colours available. Also get the pricing details for product, printing, shipping and custom acessories separately. Once the order is accepted by the system, the order will be processed and dispatched to your customers if you have sufficient payment balance. You will get automated notification and invoices from our system for the orders processed and dispatched. Any clarification on the same have to be raised within 7 days time. Returns will be managed by us. Repeat orders can be re-ordered from the return orders from the dashboard itself. We will provide free replacement or refund within 7 days time, for all manufacturing or printing related defects. All other returns will be charged for returns shipping. Dropshipping is a retail fulfillment method where a store doesn’t keep the products it sells in stock. Instead, when a store sells a product, it purchases the item from a third party and has it shipped directly to the customer. As a result, the merchant never sees or handles the product. The biggest difference between dropshipping and the standard retail model is that the selling merchant doesn’t stock or own inventory. Instead, the merchant purchases inventory as needed from a third party – usually a wholesaler or manufacturer – to fulfill orders. What is “Print on Demand T-Shirts”? Print on demand (POD) is a printing technology and business process in which T-Shirts and other garments are printed only when an order is received. Manufacturer holds plain t-shirts in stock on various styles, colours and sizes. When a customer orders a design, printer prints it and dispatches to the customer. It reduces the unsold inventory risk for the brand owners. Any T-Shirt Brand can have an account with QikInk, when an order is received on the website, it is passed to the QikInk’s system, where it is been printed and dispatched to the end customer with custom Brand Name and packaging.